These circus sweetie ruffled clown gloves will add the finishing touch to almost any female clown costume. Mix and match this item with our other clown accessories to create a costume that is unique to you. 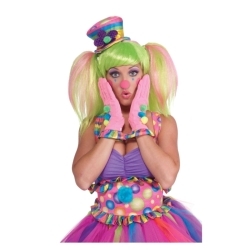 The circus sweetie ruffled clown gloves are colored as pictured and are one size fits all.